A CEREMONY to release Kimba the turtle on Sunday turned into a debate about the introduction of shark nets. About 300 locals from the northern NSW community of Ballina and surrounds flocked to Lighthouse Beach to farewell Kimba, who had just completed a three-month rehab stint at the Australian Seabird Rescue organisation after being found with a fractured skull. The occasion was marked by a mixture of celebration and concern for Kimba and his marine wildlife community as organisers took the opportunity to tell locals what they knew about shark nets and other shark mitigation strategies. ASR Chief Kathrina Southwell said although the Department of Primary Industries held its first community shark management meeting last week, her organisation had not been invited to attend. "I'll be contacting the DPI first thing tomorrow," she said. "I personally want to get on to the consultative committee." 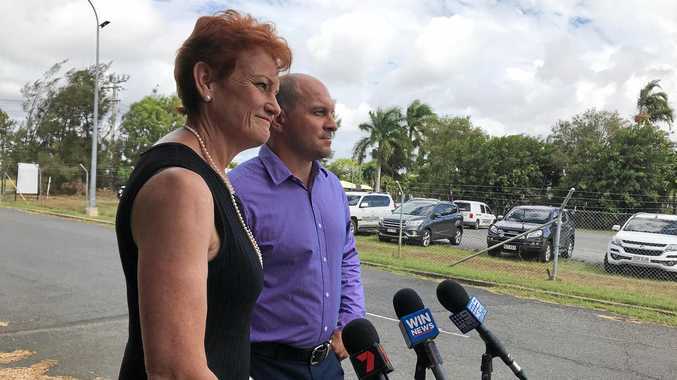 Ballina Mayor David Wright revealed last week that the DPI had plans to incorporate smart technology into its proposed shark nets that would trigger alerts every time marine life became entangled but Ms Southwell said she was not satisfied. "I don't agree with the smart technology because animals will still be trapped and some days it will be impossible to get to the marine wildlife," she said. Member for Council Keith WIlliams, who was also President of ASR, said "councillors have been frustrated that we're not being included" in DPI planning. He described a shark net as a "fishing device with a large amount of by-catch". Dr Daniel Bucher, a marine ecologist at the Souther Cross University in Lismore, shared research findings with the crowd. He said there had "never been a fatal shark attack on a patrolled beach, nets or no nets" but that beaches with nets were often closed after shark sightings and this fact led to misinformation on the success of nets. He said in one study, more than half the sharks counted in the water were on their way out from inside netted areas, proving that nets were ineffectual in keeping sharks at bay. He also said that any suggestion of culling was misguided given that sharks tagged in recent research showed no signs of lingering in any one area. Instead, sharks tagged on the northern NSW coastline were later found as near and far as New Zealand and South Africa. Dr Bucher said the system of smart drum lines was largely successful and was already due to increase from 10 drum lines to 100, making the new shark net plan redundant. He said the plan was "based on fear, ignorance and maybe politicians' careers. "It's state-sponsored slaughter of marine animals in the name of safe surfing." 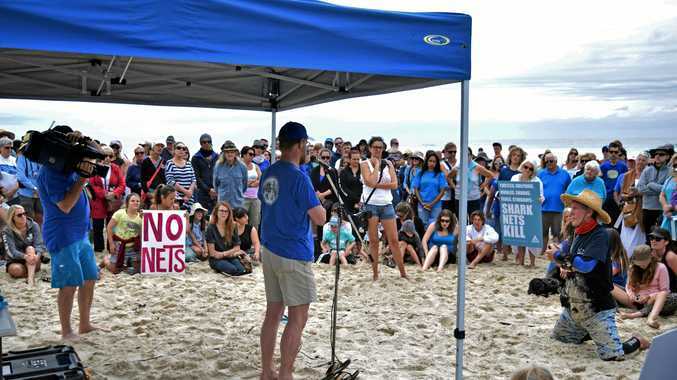 Kylie Maguire, who lived in nearby Lennox Head and was once bitten by a shark, shared her views with the crowd and said the rally was "to let the premier know that not everybody agrees with shark nets". "We believe there are other options that are safe and eco-friendly," she said. Savili Sega came with his family from the Gold Coast "to come see the turtle being released". He said "safety of surfers and swimmers is obviously important but shark nets catch everything, so it's not a good idea when they kill everything."